Thomas Sopwith senior is famous for his overseeing of the W.B. lead mines in the North Pennines. His son Tom followed very much in his father's footsteps but at a time when the UK mines were about to decline. Tom became the manager of the Spanish Lead Co., a UK company formed in 1864 to work the La Tortilla Mine to the north west of Linares, Spain. The company was later refinanced as T. Sopwith and Company Ltd. The area was exploited by a series of UK companies and generated consistent profits even at times when lead prices were low. This volume traces Tom's professional career from his visits to other European mines to his tragic and untimely death in 1898. 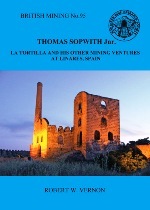 It has a detailed history of the lead mines at La Tortilla together with their associated workings is richly illustrated with many photographs and drawings from the archives at Linares, including several of the smelting works.